Police work near a damaged Home Depot truck after a motorist drove onto a bike path near the World Trade Center memorial, striking and killing several people, Nov. 1, 2017, in New York. "Based on information we have at this moment, this was an act of terror, and a particularly cowardly act of terror aimed at innocent civilians," New York Mayor Bill de Blasio said at a news conference. New York Governor Andrew Cuomo called it a "lone wolf'' attack, saying there's no evidence to suggest it was part of a wider plot. The incident took place near the World Trade Center memorial in lower Manhattan. New York Police Commissioner James O’Neill said around 3:05 p.m., a man driving a rented commercial pickup truck entered the bike path, striking riders and pedestrians. The truck also struck a school bus, injuring two adults and two children. The man then "exited the vehicle brandishing two handguns,” O’Neill said. A paintball gun and a pellet gun were later found at the scene. He was shot in the abdomen by police and taken into custody. Argentina's foreign ministry said five of its citizens were among those killed. A statement identified them as natives of the city of Rosario, who were in New York with a group celebrating their 30th anniversary of graduating school. This undated photo provided by St. Charles County Department of Corrections via KMOV shows the Sayfullo Saipov. Law enforcement officials, speaking on condition of anonymity, told media outlets the suspect was was a 29-year-old immigrant from Uzbekistan named Sayfullo Saipov, who entered the United States in 2010. Uzbekistan's President Shavkat Mirziyoyev said Wednesday the attack was ruthless and cruel, and that his government stood ready to use all means to assist in the investigation. Authorities investigate the scene around a body covered under a white sheet next to a mangled bike along the bike path, Oct. 31, 2017, in New York. The Cato Institute told VOA only about 40,000 Uzbeks have entered the United States as migrants in the last 20 years, of those only two percent arrived as refugees. 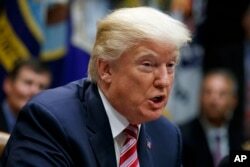 In Washington, White House press secretary Sarah Sanders said President Donald Trump had been briefed on the incident and will be continually updated as more details are known. "Our Thoughts and prayers are with all those affected," she said. Trump later tweeted, "We must not allow ISIS to return, or enter, our country after defeating them in the Middle East and elsewhere. Enough!" Followed by: "I have just ordered Homeland Security to step up our already Extreme Vetting Program. Being politically correct is fine, but not for this!" Greg Barton, a professor of global Islamic politics at Deakin University in Australia, said it seems as if the attacker was inspired by the Islamic State group. "Islamic State doesn’t claim attacks when the attacker is held in custody and so they probably won’t claim this one," Barton told VOA. "But there’s no question that we’ve seen many attempted attacks in New York and there will be more attempts in the future. Barton said stopping radicalization is not hopeless, but will require a multi-step process. "We need to educate the public, we need to think about putting in physical barriers to limit opportunities for mass carnage with vehicles, we need to be aware of friends and loved ones who might be coming under malign influence, we need to work with society, make people feel more part of society, less alienated and less therefore vulnerable to some cheap approach by a recruiter," he said.